Dual-action nitrogen saving technology that inhibits both ammonia volatilization and nitrification. 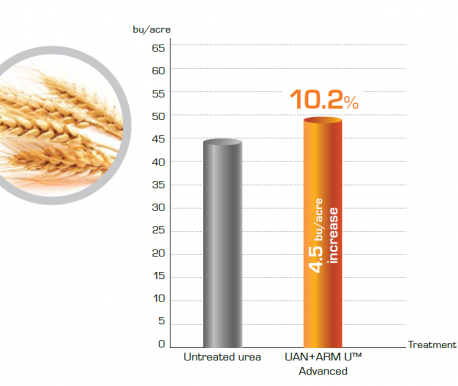 An intelligent N stabilizer, ARM U™ ADVANCED is a dual action Nitrogen saving technology that inhibits both ammonia volatilization and nitrification. It's the only product on the market to have this dual action. 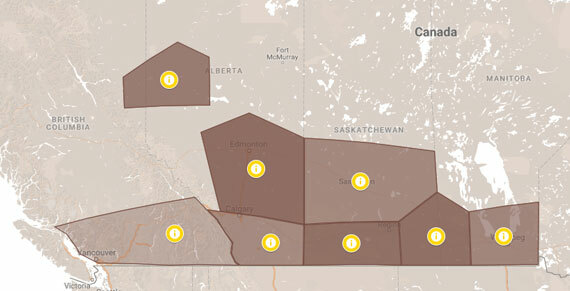 Cutting down on N losses that can occur by up to 90%. 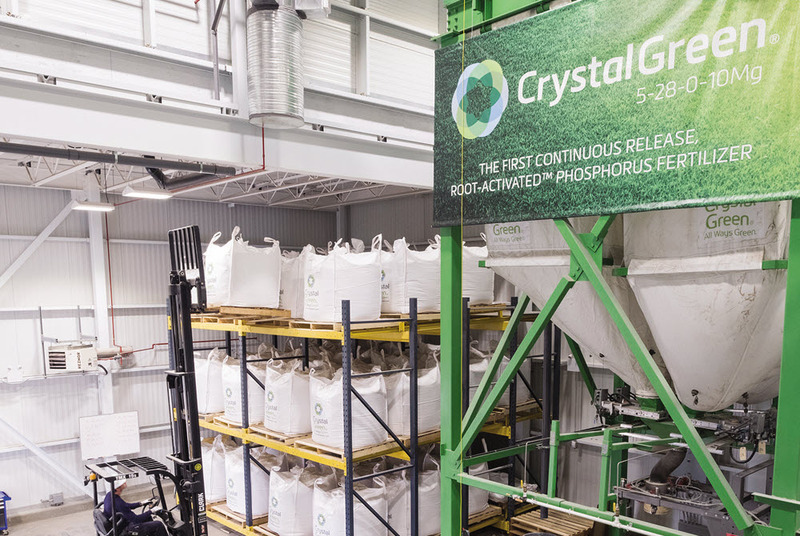 For use on Urea or UAN, it has been specifically formulated to perform in colder temperatures and offers growers a better way to get more out or their N fertilizers, increasing yields and helping the environment by reducing nitrate leaching and N2O emissions. 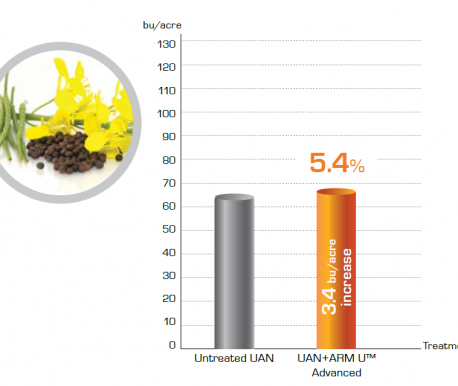 ARM U™ ADVANCED contains N-(n-butyl) thiophosphoric triamide (NBPT), which inhibits the urease enzyme activity that produces ammonia gas, stopping nearly 96% of the volatilization loss. With the addition of 3,4-Dimethylpyrazole phosphate, it also inhibits nitrogen oxidation or nitrification by inhibiting nitrosomonas and nitrobacter bacterial activity. Whenever urea or UAN fertilizer is applied to soil. 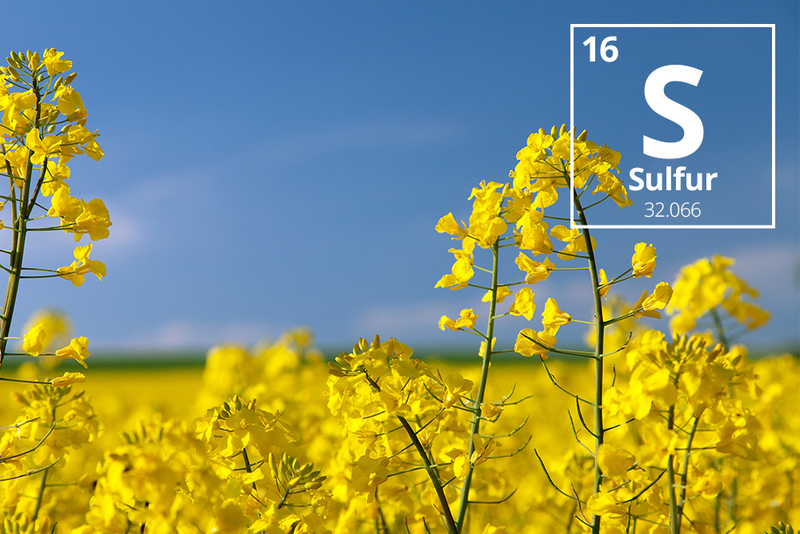 Without treatment, up to 50% of the nitrogen in soil fertilizer quickly becomes unavailable. 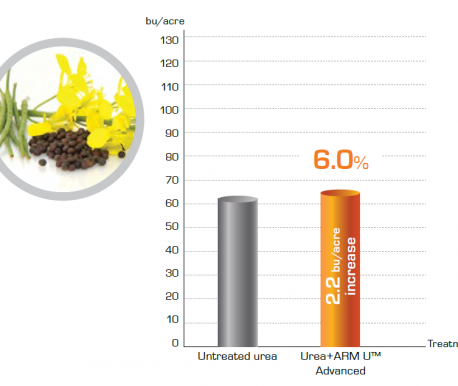 ARM U™ ADVANCED inhibits ammonia volatilization and nitrification, allowing nitrogen to be absorbed. The formula contains polymers (spreader molecules) that increase NBPT's binding rates to urease enzyme, leading to improved NBPT activity. 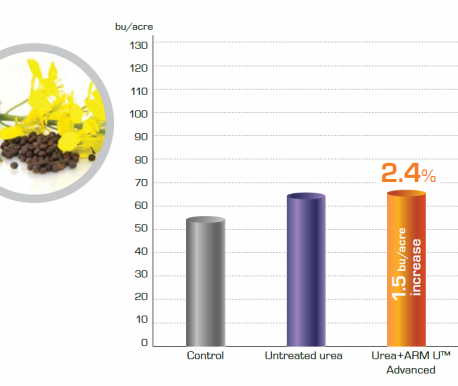 This increased activity enables a lower percentage of active ingredient and a lower use rate while maintaining efficacy. ARM U™ ADVANCED also has a high buffering capacity to keep the solution pH below 7, and to protect and fully utilize the nitrogen present in the NBPT molecule. The liquid formulation is easy to use, has a minimal odour, and also acts as a dust control agent. 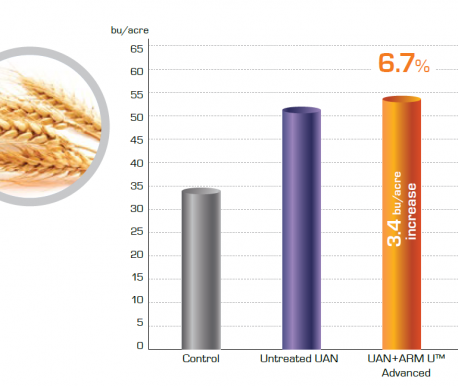 INCREASED NBPT EFFICACY & EFFICIENCY: ARM U™ and ARM U™ ADVANCED reduce nitrogen losses better than any other products on the market. 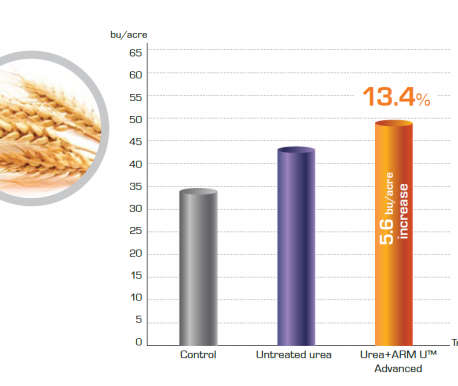 REDUCED REQUIREMENT FOR UREA/UAN: By reducing nitrogen loss as ammonia by 96%, the requirement for nitrogen fertilizer can be reduced by 20-30%. 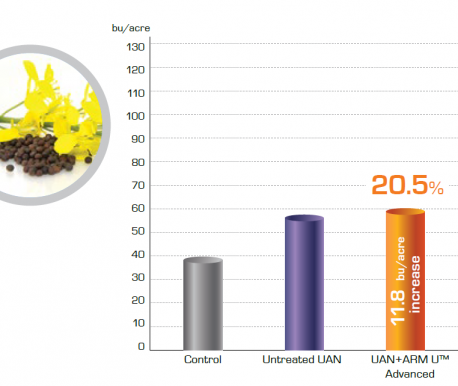 REDUCED ODOUR: ARM U™ and ARM U™ ADVANCED are buffered formulas that stabilize NBPT molecules and prevent odorous ammonia emissions. 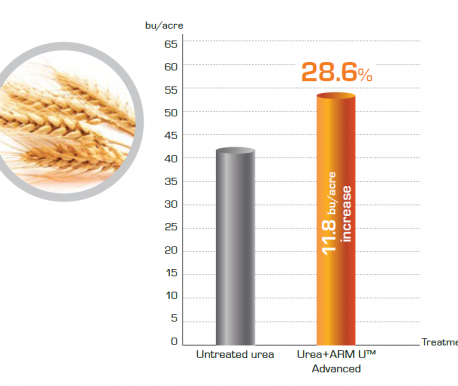 DUST CONTROL: ARM U™ and ARM U™ ADVANCED contains bio-polymers and spreaders that quickly cover urea granules, allowing for a smooth flow and reduction in dust. GREAT FOR COLDER CLIMATES: Stays in liquid form up to -15C, making it easy to handle and store in cooler conditions. INCREASED CHLOROPHYLL: By allowing the absorption of nitrogen, the development of chlorophyll is supported, fostering photosynthetic energy production and storage for increased health and growth. INCREASED PROTEIN: Increased nitrogen absorption supports the production of plant proteins, including DNA and RNA, allowing plants to manifest their full genetic potential. 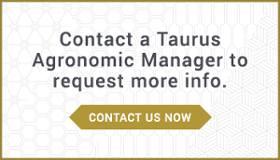 INCREASED GROWTH & YIELD: By supporting the production of chlorophyll, protein, and nucleic acids, plants grow faster, stronger, and healthier, producing an overall higher yield.